Happy Easter Everyone! Hope you and your family are enjoying this gorgeous spring day and having an Eggstraordinary Easter! Due to the holiday, there were no group classes this weekend but I was booked solid with private lessons. They were THE best lessons I’ve ever given because the ice was completely empty due to the holiday and my student and I had the entire rink practically to ourselves. I didn’t have to bother getting in anyone’s way and more importantly, didn’t have to constantly worry and watch out for aggressive and reckless hockey skaters chasing each other around and bumping into my students. I would like to take this opportunity to praise and applaud a parent, specifically my long-time student Courtney’s dad, who unfailingly comes out onto the ice on every lesson and skates while I teach his daughter during the public session. It really is a great effort on her dad’s part to join us because I feel he is being a positive role model, providing his daughter constant support and encouragement on the ice. He’s helping Courtney to nurture a love and enjoyment for the sport by skating himself! I feel having her dad on the ice also shows Courtney that skating is a great family activity which helps bring the two closer together and foster a stronger bond between them. When Courtney’s dad is out there on the ice, he’s also showing everyone that skating can be fun and can be enjoyed at any age! 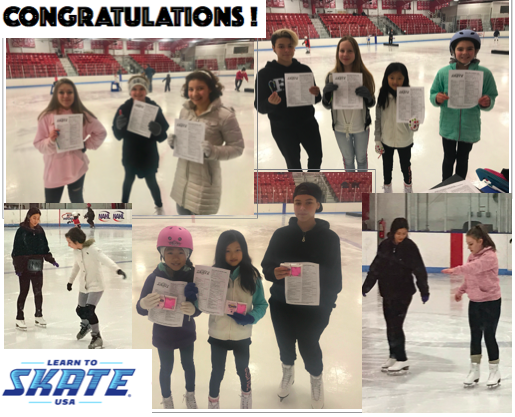 I’m so proud of all my Learn-to-Skate students who passed their tests this weekend! Can’t wait to get started on teaching new skills at our next group class. Don’t forget to sign up for the new 7-week winter session! I knew there was a scientific answer to this question and it had to deal with the principle of inertia. But I’m not a science person and will not take physics until my senior year next year. When you spin, you get dizzy because there are fluids which get sloshed around. There are three tubes that are filled with fluids in your inner ear and each tube is aligned with a different motion- up and down, left and right, and side to side. The sensory nerve cells in the hair lining of the ear canal carries signals to your brain which gets interpreted as movement. When you stop spinning, the fluids continue to slosh around in your ear and so your brain still thinks you’re spinning but you’re really not and that’s why you get dizzy. Figure skaters and ice dancers have the same tubes and fluids in their ears like all of us and their fluids also get whipped around. So then how come they don’t get dizzy and disoriented when they spin or twizzle?! Even if you’re not an elite skater, there’s no way to avoid not getting dizzy- you can’t even disguise your dizziness. The answer is PRACTICE, PRACTICE, and more PRACTICE! If you practice spinning over and over many times then your body is trained to get use to it and gradually overcomes the dizziness. Aha!, so I was actually 100% correct when I told Courtney that I just got use to spinning and don’t get dizzy! It’s because I’ve trained intensely for so many years that I can recover from a spin with grace without feeling at all dizzy. There was no scientific reason after all. Skaters train hard to make their moves look so effortless! I’m so happy to organize and lead another successful National Skating Month open house event for my community. National Skating Month is US Figure Skating’s biggest annual campaign and the goal is to increase awareness and participation in the U.S. 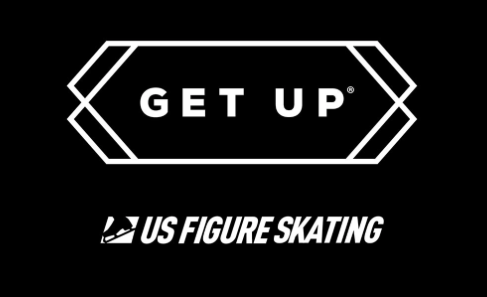 Figure Skating programs and Learn to Skate USA and recruit new skaters. This year’s National Skating Month theme is discovering your inner superhero and ‘Skate to Superpowers’! With the help of my Garden State Skating Club and Howell Ice Arena, we offered free half-hour group lessons taught by professionally trained instructors with the assistance of club members. Following the free lessons, we put on a skating exhibition showcasing the many skills and talents of my club teammates who performed their new season’s freestyle programs. We ended the event with a family public session to encourage families to enjoy more skating on their own. Thanks to the coaches, skaters, and parents who all came out to volunteer and help promote the great sport of skating to our community. Everyone enjoyed a great day of skating and fun times and laughs with friends and family. Happy New Year! I’m so excited and can not wait to start our new adventures in skating together. To my new students, welcome!… and to my wonderful dedicated old students, welcome back! I thought this would be a good opportunity to review some of the main so you can get the very most out of every lesson. You can obtain more detailed information on each of these tips in my prior blog posts and/or use my quick one-page reference sheet, Essential Skating Tips for Beginners. Have a fabulous first day on the ice!